Delightfully moist and tender with the perfect amount of sweetness. These whole grain Maple and Brown Sugar Oatmeal Muffins need to make it to your breakfast table. Have you ever eaten the Maple and Brown Sugar oatmeal packets? I remember growing up that flavor was always the favorite in the mix of oatmeal packets. 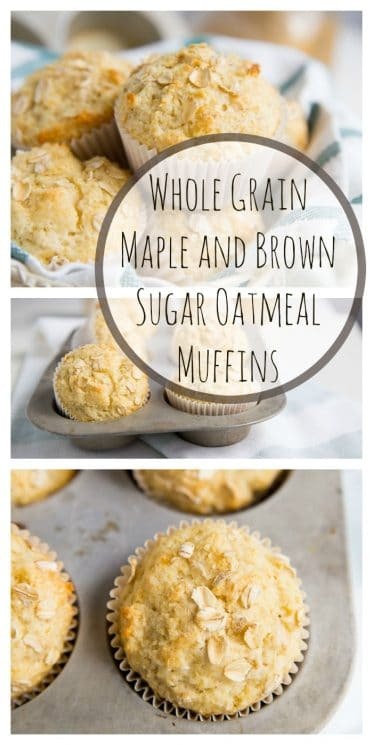 Maple has a unique sweet flavor – hints of caramel with overtones of toffee……mmm and combined with that deep sweetness of brown sugar it makes these muffins so incredibly amazing. 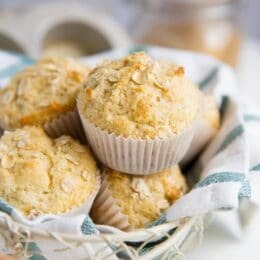 Oats have a nutty flavor and make this muffin feel more hearty and something that can get your kids through the morning. 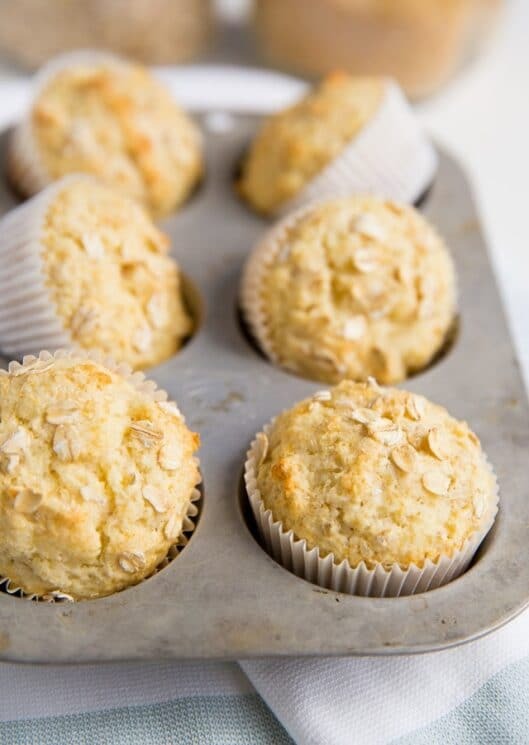 Combine all those delicious flavors and these Oatmeal Muffins will be your jam! Let’s talk about oats for a minute. 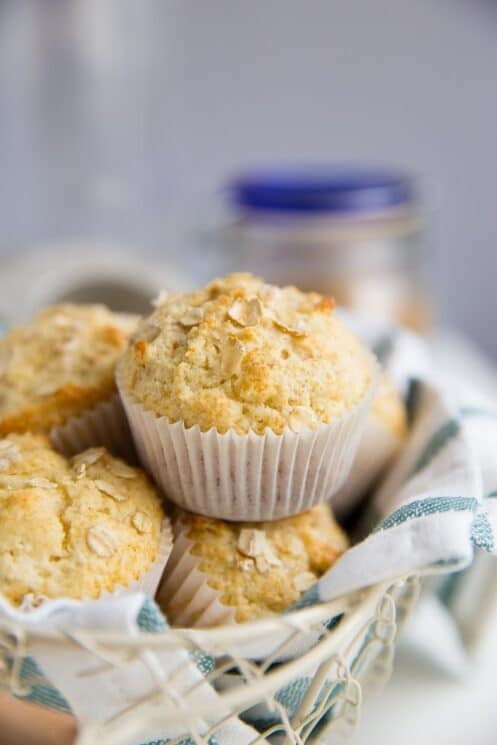 Oats are loaded with vitamins and minerals so adding them into a muffin is the perfect way to power pack nutrients into a food your kids will eat! Oats have protein and fiber and definitely add bulk to keep you feeling fuller longer. They are great for kids who don’t get to eat lunch until a little later in the day. So what are the different types of oats, and does it make a difference what kind you eat? If you cut groats into two or three pieces, you get steel cut oats. They cook quicker than oat groats, because water can more easily penetrate the smaller pieces. Rolled oats (sometimes called old fashioned oats) are created when oat groats are steamed and then rolled into ﬂakes. This process stabilizes the healthy oils in the oats, so they stay fresh longer, and helps the oats cook faster, by creating a greater surface area. If you roll the oat ﬂakes thinner, and/or steam them longer, you create quick oats and ultimately instant oats. The nutrition stays the same (these are all whole grains) but the texture changes – a plus for some people and a drawback for others. Basically the less processed the oats are, the better they are for you. However, the texture of the oats makes a difference in how you will want to use them. Steel Cut Oats are not as good for baking as rolled oats because of their rough texture. And depending on the type of texture you prefer, quick oats may not be as good for plain oatmeal. 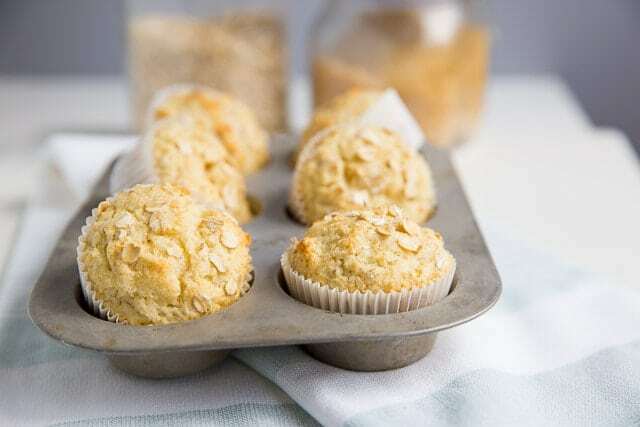 There are a lot of reasons that muffins can turn out too short, dry, crumbly or bland! We have made hundreds of different muffin recipes and these are some good tips we have found to making muffins that are really delicious! If you are going to spend the time baking, you definitely want them to taste good so your kids will eat them! The number one rule to making muffins is to NOT overmix. Once you combine the wet and dry ingredients, you only want to mix until they are barely combined. If you overmix, you will have dry little hockey pucks! Don’t overbake. If cooking time is 25 minutes, think of that as 20-30 minutes. Ovens bake differently and so it is better to start with less time and add more if needed. Always use buttermilk! It makes your muffins super flavorful and moist. Quality ingredients make quality products. 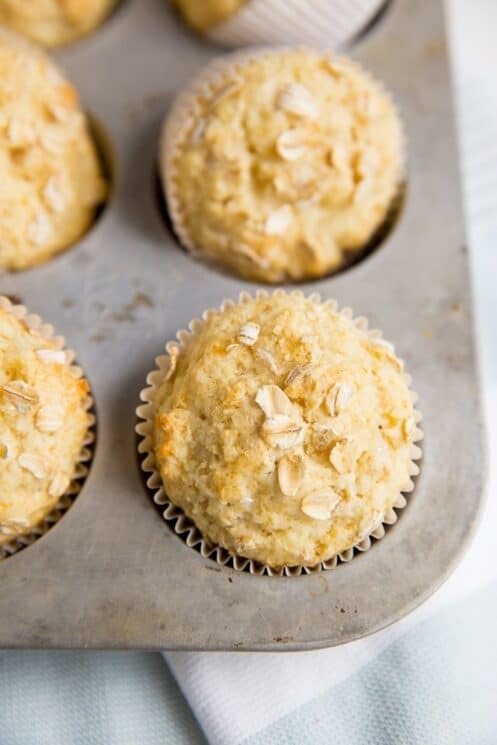 If your flour is getting a little stale, your oil is old or your frozen berries are covered in ice – those will affect the flavor and texture of your muffins. If you want a delicious muffin, start with ingredients that are fresh and tasty. 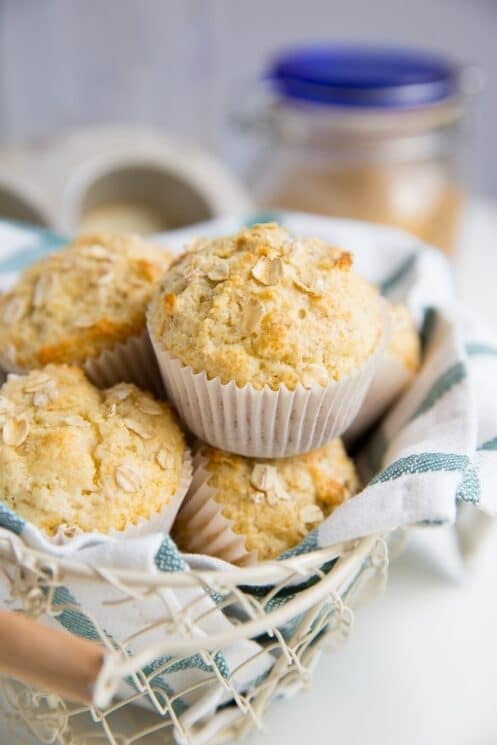 If you are wanting to switch up your breakfast routine, and try out a new recipe, these Whole Grain Maple and Brown Sugar Oatmeal Muffins are worth a try! Give your gets some good nutrition with a muffin that tastes delicious! Preheat oven to 400 degrees F. Fill muffin tin with paper liners or spray with nonstick cook spray. In a separate bowl, mix wet ingredients together. Fold wet ingredients into dry ingredients; stir just until moistened. Fill muffin tins 3/4 full. Bake for 15 minutes or until a toothpick inserted in the center comes out clean. Cool slightly before serving. My kids are allergic to coconut. Think subbing olive oil or melted butter would be good? These look so good! But I don’t see brown sugar in the ingredients list…is the 1/2 cup sugar listed meant to be brown sugar? Any suggestions for making it gluten free?? These looks delicious! Do you think I could use coconut sugar instead? I was wondering if can use coconut brown sugar not brown. Also what is substitute for buttermilk? Where do you find your whole wheat flour? Is it supposed to the a tablespoon of baking powder or a teaspoon? I used a tablespoon and I think they’re a little metallic tasting. I have 2 questions. The recipe calls for dry oats. Which kind of oats are those. I also will like to find out what are buttermilk? I googled it, but I kept finding pancake buttermilk. Is there a specific one you recommend?